Games and toys are great to use with almost any group of children, especially with the action-minded ones. In a program these games can be divided into three periods of activity: making, decorating, and playing. Thus it will not matter that some children are finished working before others, since the play time is flexible. Children seem to treasure homemade toys and games more than new ones (most times), especially the ones which are kept and handed down from generations to generations. Who can blame them? There is history and mystery behind them. Encourage children to make new memories by making their own toys instead of buying from a store. A popular homemade toy (among girls) is the doll house. Most are made from cardboard or wood (with the help of an adult) with homemade furnitures. As for games, you have tons to choose from. You can make your own yo-yo, jigsaw puzzles, and the classics such as tic-tac-toe, snakes and ladder, chess and checkers. To make a slingshot to shoot pieces of paper, all you need is wire (like the type you find from a wire hanger) and a rubber band. 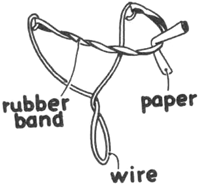 Twist the wire as shown in the picture and make loops at each end to hold the rubber band. Fold little pieces of paper, make a target, aim, and shoot. Don't use anything other than paper and always ask your parents permission before making toys such as this. Take a sheet of paper or a piece of newspaper and wad it up very tight. This will make a good center for the ball. Then wind rubber bands very tightly around the center, winding first one way and then the other so as to keep it round. Colored rubber bands can be used if you have them—they make a bright colorful ball. The ball can be made as large as you want, but 11/2 inches in diameter is a good size. This is fun to do. And you will have lots of fun when you are finished. You'll be surprised at how high it will bounce. For a Softer Ball, Try This Yarn Ball Craft. To do this you will need a piece of wood 18 inches square—or a square of heavy brown corrugated cardboard will do. Use five empty spools—more if you wish—and attach them to the board with hot glue (parental supervision required) or wood glue. Then in crayon or paint put numbers under each spool as shown. Rings can be the rubber jar rings used in canning or rope tied in circles. See the picture above. Devise your own rules. A suggestion is that each player toss three rings at a turn. The first player to score a total of 1,000 is the winner. This is lots of fun if you have a large play space, but it is definitely not recommended for the living room or any place where you might knock over lamps or pictures. Take a medium-size paper bag and stuff it with sheets of crumpled newspaper. Pack it tightly and then fasten the bag with a string or rubber band. This is the ball! String a rope between the tops of two chair backs and hit the ball back and forth as in volleyball. If the ball hits the floor before you hit it back, that is a point for your opponent. Make the game 15—whoever scores 15 points first is the winner. This game is particularly good for attics, garages, or basements, where you have plenty of space and no danger of breaking anything. It is fun in the backyard, too. Go and find (1) a bean (2) a small box (3) a shoe box or shirt box lid (4) Scotch tape. How about you build this fun game. You will need to hone your aim to get this bean in the tiny little door. The smaller box needs a door in it...the side that is facing downwards can be cut off. Tape this down to the inside of a shoe box lid. Get competitive and time yourself and your friends to see who can get the bean in the door first. Don't make this if you or anybody around you has a peanut allergy. Now get a cup out and poke a hole in the bottom of the cup. Put a string in the hole and tie a knot on the inside part of the cup. 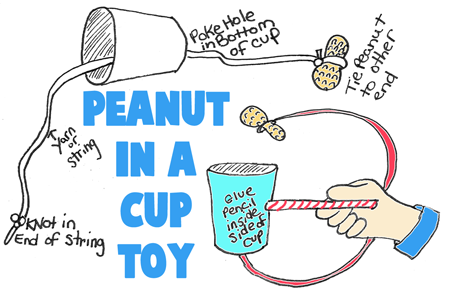 Then pull it through the other end and tie a peanut to the other end. Then...put a very small hole in the site of the cup and stick a straw through the hole ... you could also use a chop stick or a pencil. Glue it in place. Now play the game of trying to get a peanut in the cup. When you get good at it, see how many you can get in the cup in a minute and then compete against a friend. This marble game often called "Stabling Your Horses" is easy to construct and great fun to play. Use a cardboard shoe box for the table. Remove the cover. Turn the box upside down and cut 5 entrances to the stable, using one of the 2 long sides of the box for these entrances. The smallest entrance should be about 1inch wide and 1 1/2 inches tall, and the longest about 2 inches wide and 2 1/2 inches tall. 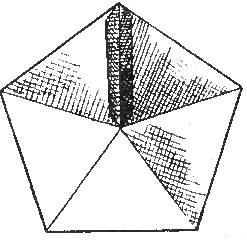 Mark over each entrance the figures 5, 10, and 25 as indicated in Fig. 1. To play this game, place the shoe box stable against a wall. 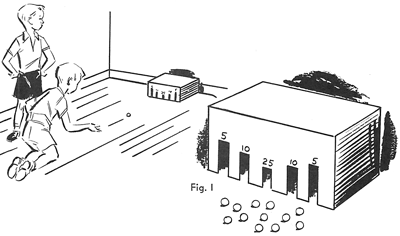 Then measure off a distance of 4 feet in front of it on the floor. 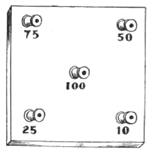 Give each player 5 marbles depending upon the number of entrances. Each player rolls or shoots his marbles from the 4 foot marking, shooting all of them at each turn. The game may be continued as long as desired. However, it is well to reach a predetermined score, such as 100 or 250 before beginning the game. The player first obtaining this score wins the game. 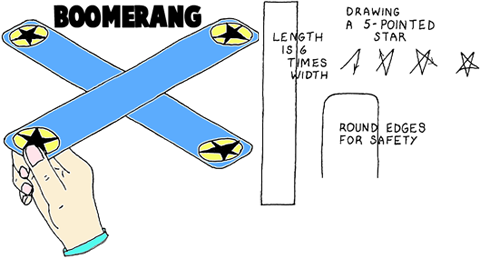 By the use of different throwing methods, a boomerang can be made to go through some interesting maneuvers. This is strictly an outdoor toy. While a small cardboard boomerang won't break a window, it can hurt someone's head so should be thrown at some distance apart; and caution to children to watch what others are doing. Regardless of size, the length of the arms should be about 6 times the width. Arms 2" x 12" make handy size. Staple or glue teh arms at right angles to each other, in the centers. Glue will take about 15 minutes of drying before the boomerang is ready for throwing. For safety, round all edges. Color with crayons or markers. It is very simple to make these paper tops. Just print out 2 diagrams out...either black and white or color diagrams. 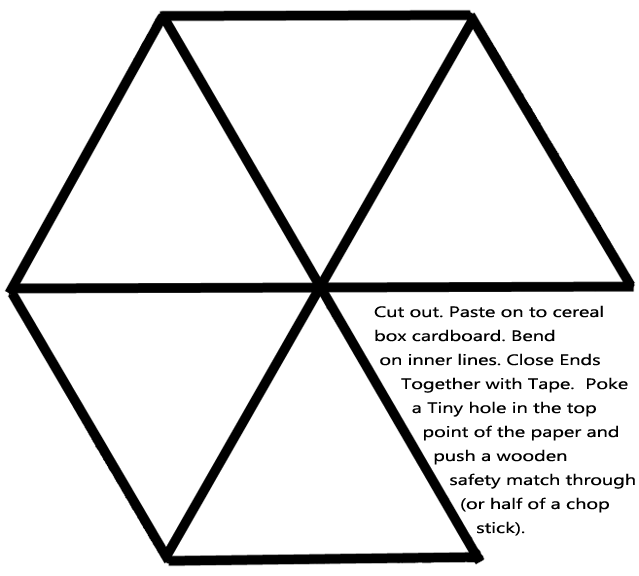 Cut out the diagrams and then fold on the inner lines until you have a five sided pyramid...tape together. Do the same thing for the second pyramid. Now place them bottom to bottom and tape them together this way. Then push a wood safety match stick, a pencil, or half of a chop stick through both holes. Now spin the top. 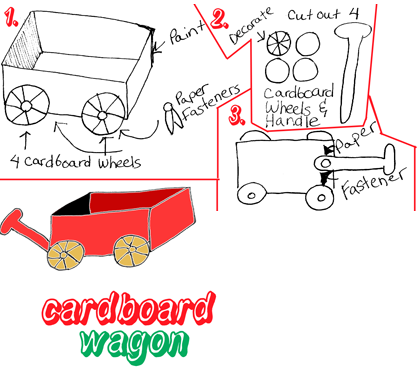 It isn't hard to make a toy wagon. Just find an empty shoe box. Decorate it by painting it, covering it with wrapping paper, or however you want to decorate it. If you are to paint it, just add a little bit of Elmer's glue to the paint to help the paint adhere to the waxy surface of the box. Also cut out 4 wheels and a handle and paint them as well. Then attach the wheels to the side of the box with paper fasteners...attach the handle to the bottom of the box with a paper fastener as well. Cut out the fish from sheet cork. Regardless of the design, the fish should be at least one inch wide and 2 inches long, so a hole may be punched, and so that they are a comfortable size for the kids to handle. After the fish have been cut out and punched, crayon heavily to waterproof the sheet cork, and to identify the fish. The hooks are bent paper clips, tied to the end of a string 12 inches long. Attach the other end of the string to a pencil-sized stick about 8 inches long. Do not have the string any longer, or the game will be too difficult to play. Throw the fish in a baby pool or a tub full of water. 3 or 4 kids to a tub and is plenty - see who can get the most fish. A cable car is a vehicle which hangs on a long steel rope. It carries people between high cliffs and across valleys. 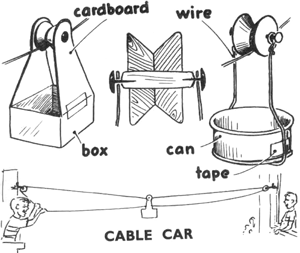 Make a toy cable car from a box or can of any kind (part of a milk carton would also work). From wire or cardboard, form two hangers, choosing one of the shapes in the picture. Tape them to the sides of the box or can. For the wheel, have your parents cut the inner part from a spool and glue the two ends together (or use a bobbin or take the spool out of a vcr tape that your parents say that you can have). To hold them together, put a strong stick through the holes. Fasten the wheel to the hangers with two tacks or flat-headed nails. If your window is near a friend's window, you can run a string on pulleys from one to the other, and hang your cable car on it. Then you can use it to carry messages back and forth. This sort of beanbag is used for assorted games and juggling in Japan. Because of its rounded shape, it flies through the air better than the conventional flat sort of beanbag. Leather is a lot easier to make this out of, but the normal Japanese beanbag is made out of cloth, so either one works. Make cardboard patterns for the pieces. Whatever the size made, use the proportion of twice as long as wide on the sections. Sections 1 1/2 by 3 inches make a nice handful. Attach the four pieces in a cross-shaped pattern as shown. Then turn and sew each section, one at a time, as shown, leaving the top open for stuffing. Stuff with enough beans to make the bag about 1 inch thick, and sew up the rest of the edges. Though it may be hard to visualize from words and diagrams, this is easy to make. Try a sample first. 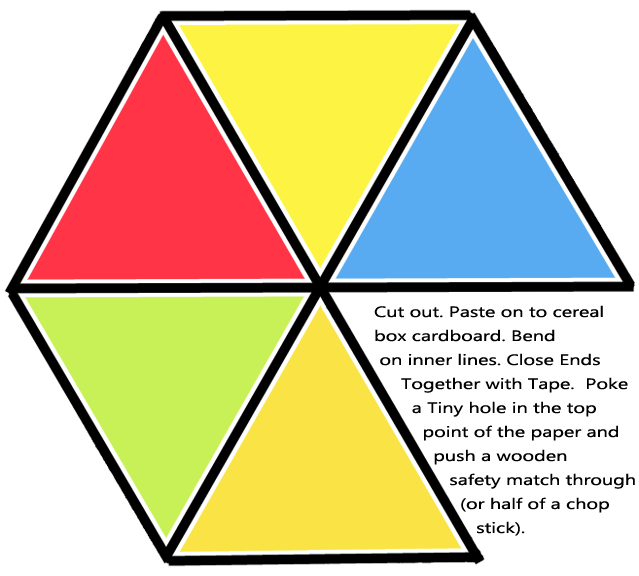 This knock down game is a great game to play at a picnic or cook out. The game is made from corrugated cardboard nailed to a wood base. The wood should be thick enough to hold up the target and run the length of the bottom. Fasten with large-headed nails, so that they cardboard will not pull out. Paint or crayon in numbers, a target, a clown face, or similar designs on the cardboard face. Compete agains your friends and family members. Use balls that you already have or you can make the Japanese Bean Bags or the Juggling Balls craft. These are made from corrugated cardboard, with holes cut out in the shape of the objects you want thrown in the game. Use a folded piece of cardboard, such as a pizza box, or hinge two pieces of cardboard with duct tape. Poke holes in the bottom corners of the boxes to attach together with rope or string. Decorate the faces with a target or baseball diamond, and cut holes in the cardboard a bit larger than the things to be thrown. You can use bean bags, sugar cubes or dice, corks, or other objects. 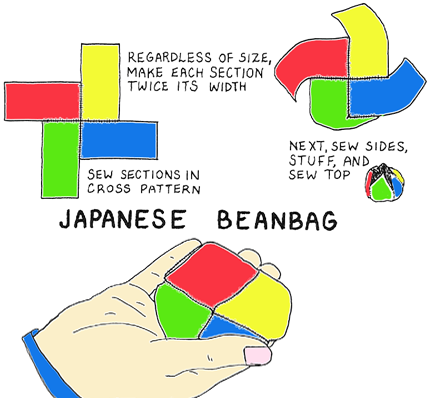 Here are some Japanese Bean Bags. 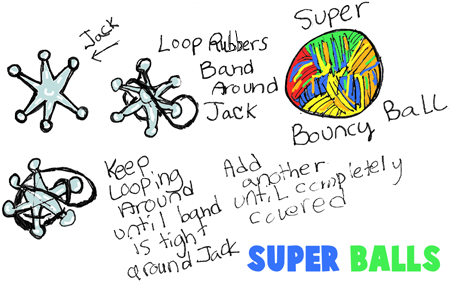 If you have any toy jacks hanging around your house, and you have some rubber bands, you can make a super high bouncy ball. Just take the jack and loop the rubber band around the jack. Keep looping it around the jack until the band is tight around the jack. Add another rubber band...and another...and another until the ball is as big as you want it to be. This is very easy to make. Paint 2 cardboard boxes blue. Let completely dry. Then cut doors in the front of both boxes and glue together so both doors are in the front. Cut a slit on the top box's top lid. Use rope for handles, tying knots in the back of the door to keep the rope on. Write US MAILBOX on the front. 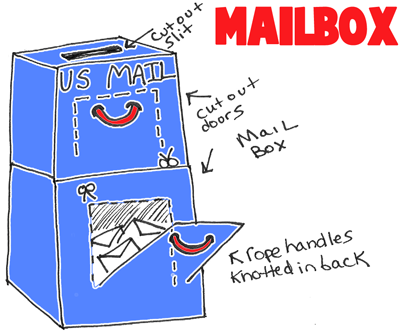 People sending mail can put the mail in the top slit, and packages in the top door. The mailman collects the mail with the bottom box so he can deliver the mail to people on his route. 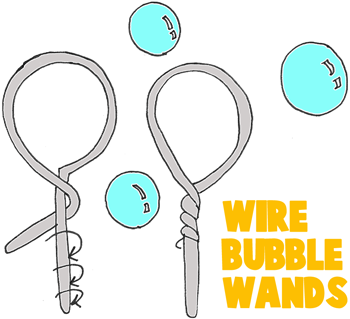 Use either craft wire or a wire coat hanger to make these jumbo bubble wands. These bubble wands make the huge bubbles that you have seen on tv or in the park. If you are using a clothing hanger, than you first have to untwist it. Make a huge circle and then twist teh rest of the wire upon itself so that no points are sticking out. Then fill a flat tin with bubbles and get blowing those bubbles. Just Mix together and you are set to go. 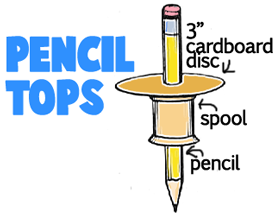 To make this toy spinning top, you will need 1 thread spool, 1 pencil, one 3" diameter cardboard disc, glue, 1 crayon, and scissors. Firstly, Color cardboard disc and spool. Glue disc to spool after making a hole in the center the same size as that in the spool. 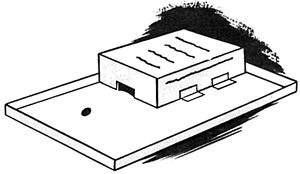 Insert pencil through disc and spool so point is opposite disc. (See sketch.) Now top is ready to spin! How to Make a Magnetic Travel Board Games Set with Altoids Tins - Today I will show you how to make a really cool travel board games kit out of magnets, paper and an altoids tin. This is a great travel game board system that you can stick in your pocket to bring to school with you to play on the bus, in the cafeteria, or what ever. You could even bring it in the car with you to play with your sisters and brothers with. Or you can just play solo since there are 2 different solitaire games to play. How to Make Juggling Balls & Stress Balls from Balloons and Lentils in Easy Craft Activity - Today we will show you how to make your very own juggling balls….with balloons and lentils. This is a fun family activity to do with your sisters and brothers and parents. These juggling balls feel a LOT like stress balls, so they can also be used for that purpose as well. The step by step instructions can be found below. How to Make Simple Pinball Machine with Recycled Materials Crafts Project for Kids - This is a super cool crafts activity that we are going to do today. If you love playing pinball, then you will love making this simple machine…a pinball machine. Just recycle some old stuff from around your house … such as a cardboard box, and let the fun roll in….literally. How to Make a Mini Zip Line Moving Toy Crafts Idea for Kids - This is a really cool toy idea…one that can be changed for a lot of different variations of moving toys. This is an air ship / space ship zip line moving toy. Find out how to make this zip line toy that zips and moves, by reading the step by step, illustrated instructions below in our crafts project tutorial. Make a Ring Toss Game - Learn how to make a simple ring toss game. How to Make a Flying Butterfly Toy that Flies up to 15 Feet- This is an arts and crafts project to make a butterfly toy that will really fly up to 15 feet up in the air. This is for older kids as it is too difficult for younger kids to master…although they can with some supervised guidance from an adult. Whistling Birdie Toy - Make a real Whistle that we call a whistling birdie with the following step by step tutorial. You make the bird whistle with a drinking straw, polymer clay, and a toothpick. How to Make Cardboard Tabletop Billiards Pool Table Craft for Kids - So what if you can’t afford a big expensive pool table to play billiards with. Today we will show you how to make a tabletop billiards game that you can make with a recycled cardboard box and some checkers (or bottle caps). If you can flick with your finger, than you will be able to play this game. Paper - Cardboard Dress Up Doll - With our printable template, you can make a cardboard stand-up doll. Then print out our clothes, hair, and accessories templates, cut them out and stick them on the doll. So much fun. Yarn Octopus - The craft is an easy one, but it is sure to be a lot of fun. This Octopus toy would make a great gift to give to somebody this Holiday Season. Or, if you like…. keep the toy for yourself. How to Make a Balancing on Your Finger Paper Parrot on a Perch Toy - Learn how to make this cool long-tailed parrot that balances on a ringed perch. This cut-out paper toy printable is one that will swing in a ring or perch on one’s finger or balance on a single toe. This is both fun to make and to play with. Find out how to make it below. Make Sailor Moon Wands - If you love Sailor Moon...this is a great toy wand to make and play with. 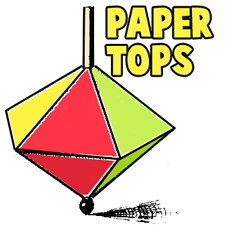 Spinning Tops Made with Paper Strips - All you need are some paper strips, glue, a pen, and a toothpick. You will see how easy these are to make and how much fun they are to play with. Make Pull-Along Toy Snakes with Corks and String - Learn how to make your very own pull-along toy snake with the following instructions. It really turns out to be a really cool toy when finished. This is a great toy for boys…who tend to love to scare girls with these cork snakes. Find the directions below. 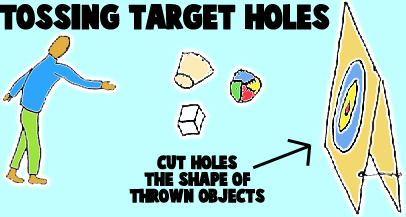 Make Ring Toss Game - Learn how to turn a normal cardboard box into a fun ring toss game. Make a Toss the Spool in the Hoop Game - Make this twist and aim game...you can't touch the spool to the sides of the hoop or you lose the game. Making a Toy Puppet Marionnette- This is so much fun to play with and it only takes a little while to make. You can then put on a bunch of puppet shows for your friends and family members. Just make sure that you or your friends aren't allergic to peanuts first. Make Toy String Cup Phones - Learn how to make this classic toy phone. Paper Spinner Airplanes - Okay, well these aren't exactly airplanes but they are similar - they are a spinny flying fun time. 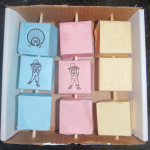 Milk Carton Toy Blocks - Learn how to make interlocking toy blocks with upcycled milk cartons. Make a Toy Gas Pump - Use a Milk Carton to Make a Fun gas pump for your cars and other vehicles. Wood Pocket Checkers - Have your parents help you with this woodworking project to make a pocket set of checkers. How to Make Toy Movie Box Craft for Kids on Rainy Day - You can make movies out of your comic books or your own drawing, and have loads of fun showing them in this Peep-hole Movie Theater. Learn how to make this toy movie / cartoon show box out of a cardboard box and creativity. 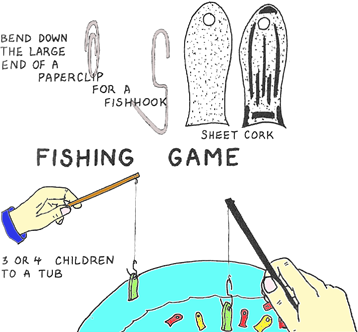 Find out how to make your own toy with the following easy directions. Mini Chinese Checkers Game - Here is another woodworking project - find out how to make this child-size Chinese Checkers game. How to Make Twist Tie Doll Figures with Moving Limbs for Your Doll Houses - If you want to make your very own play dolls out of recycled twist ties, then find out how to. They come out really cool, with hug-gable & twist-able arms and legs … especially cool for Mom dolls that hug baby dolls. Find out how to make these from unused items around your house. Have fun. Hopa Mitica Doll - Push it Down it Pops Back Up - Learn how to make a Romanian Doll, called a Hopa Mitica Doll. How to Make Toy Parachute Crafts Instructions for Boys and Girls - All kids that I know love playing with toy parachutes. You can make a parachute that will float down from the sky with its passenger. You can tie on toy soldiers or other toy figures, or even a little doll of some sort for girls who would prefer that. Throwing the toy parachutes into the air after they are made is really fun, as you will see. Make Spool Dolls - Learn the basic steps to making a spool doll figurine. How to Make Tin Can Phones - The basic directions for making the classic toy tin can phones. How to Make Color Wheel Spinning Toys Craft Idea - This is a good arts and crafts activity to teach kids about colors (and it is a lot of fun to play with). Kids will be so surprised when they find out that when they spin the toys, the colorful rainbow of colors turns into a charcoal gray. You can teach kids a little bit of science and lit bit of art with the use of this crafts project. Have fun. Beanbag Orbit Game - Learn how to make this fun Eskimo game. Fabric Strip Jump Ropes - This turns out amazingly, and they are so strong and beautiful to look out. These make great jump ropes. Making Knight's Toy Sword - Learn how to maket his pretty cool looking toy or costume sword. Egg Carton Tossing Game - Paint points on each hole in an egg carton...then use beans, beads, or corks. Easy to Make Kokeshi Dolls - This Dolls was made with a walnut, a wooen bead, some decorative paper, and paints. Make your doll with a lot of love. Paper Twirler - Make this fun paper twirler with some wood blocks and some paper. It can be made in minutes but you can play with it for hours. Cellophane Dancers - Make a dance studio with paper figures that jump and dance inside a cardboard box covered with cellophane. Jigsaw Puzzles from Magazine Pictures - You can make your own jigsaw puzzle, find out how. Intercome on Your Back - FInd out how to make your voice come out of a box on your back with the help of a hose and a funnel. How to Make a Bullseye Game Finger Ring - This craft doubles as a ring and when you take it off, you can set it up to be a game. Fishing Pond Game- Can you catch all the fish in the fish pond? It takes a lot of concentration and coordination, but I think you can catch them all. Button in the Box - This is a fun game, learn how to easily make it. Lego Pinball Machines - Learn how to make a pinball machine with Legos. How to Make a Wooden Ring the Stick Game - Make this fun game with a wooden stick and a cardboard tube. Making Fun Light Battle Toy - Use Tin Foil to make these cool light battle boards. Wood & Toilet Paper Roll Catch in Cup Game - This is a fun boredom-buster type game...find out how to make it with the following instructions. Color Wheel Spinning Top - Find out which colors mix together make which resulting color - but have fun while you do it. Shoebox & Spools Doll Bed - Make a bed or crib for a baby doll with a spool and a shoebox. Milk Carton Movie Theater - View your comic strips in this milk carton movie theater. Miniature Puppet Show Theater - If you have a shoe box and a free afternoon, learn how to make a really cool mini puppet peep box. Flying Saucer Shuffleboard- Draw the shuffleboard game on the sidewalk and then use foil pans as the flying saucers. Spin the Button on the String - This is a fun thing to do when you are bored. String a button on a string, spin it and pull. Toy Clock for Learning to Tell Time - Preschoolers and young children can play with this toy clock to learn how to tell time. Pie Pan Aiming Game - Throw & Aim the flying saucer into the hole of the coat hanger. Paper Toy Rocking Horses - Print out this model horse, fold it in half and then use a paper clip to make it rock back and forth. Make a Paper Bag Hobby Horse - Make this ride-on toy horse with a broomstick, some crepe paper, and some paper bags. Making Wooden Hole-in-One Game - A great first-time woodworking project for kids. Use a cork, bead, or ball as the object to catch. Wood Pocket Tic-Tac-Toe Game - Learn how to make this fun woodworking project. Mini Yarn Puppet & Theaters - Make this mini yarn puppet in a matches box puppet theater. Color Wheel Spinning Toy - This is a 3 tiered color wheel so it is more complex than other color wheel spinning toys. Find out what mixing 2 colors together results with. Fairy Lights Painting - Paint with fairy lights by using bubbles and paint. Turns out very cool. Gag Jack in the Box - Hide a spring up Jack in the box guy that somes out of a little folder.